The challenge is a simple binary that first sets a few seccomp rules to disable all the syscalls besides open, close, read, mprotect and exit. Then it proceeds to read 0x100 bytes into a stack variable that serves as an obvious stack overrun. To further complicate issues the binary is executed by a wrapper, that reads 0x800 bytes and passes it to the program on its stdin, in one burst, while it also closes the stdout pipe. The binary is not compiled as a PIC and full-relro is not turned on, this enables the use of the return to CSU primitive (also suggested by the hint). The primitive allows us to call a pointer at an arbitrary location in the address space with the first three parameters controlled. Since there is no way to leak addresses from the binary (stdout closed, no write syscall) we must use that is already there. This very simple binary only uses two libc functions (alarm and read), the address of which are present in the .got.plt section, at a known location. Since rax cannot be controlled by ROP gadgets the return value of read must be used to set it. Read 10 bytes to somewhere to set rax to 10 which is mprotect’s syscall nr. The shell code can read the flag and use a timing channel to leak its bits. In each execution it can crash and close the connection or go into an infinite loop based on the next bit of the flag. The difference in the time of the connection interrupt can be detected at receiver side, thus the flag can be reconstructed. The original read to overwrite the LSB of alarm can be 10 bytes long, setting up for the mprotect call. Call read, to read the address of the shellcode right after the read pointer in .got.plt and read the shell code as well. I started this challenge after finishing Wiki since my team still did not solve it at that time. I though I would grab this low hanging fruit fast and move on to the harder challenges, as it was categorised as an easy task and had many solvers. Boy, was I ever wrong! If you are looking for the efficient solution for this challenge, I suggest you keep looking, my solution is full of detours and I made this challenge significantly harder than it should have been. What is interesting for us is obviously the 4 byte machine code we can run and the printing of the rdtsc clock. Since that is the only information sent to us we will have to use it to leak addresses. This and an unhealthy dose of caffeine should be enough to finish the exploit. The value of the Time Stamp Counter is saved to R12 before the call to our code. Later, when the loop has returned, it is subtracted from the current value of the Time Stamp Counter. It is easy to see how we can use this to leak addresses; we can subtract a value from R12 and we receive the subtracted value plus the time that passed between the two rdtsc calls. If we want to leak accurate addresses then we need to guess or know the time spent between the two rdtsc instructions. On the other hand, if we only want to get the base address of a mapping we don’t need accurate values as base addresses are page aligned, so the least significant 12 bits are always going to be zero. Leaking the stack base or executable page is straight forward as their addresses are already present in registers (RSP and RIP respectively). At this point any sane person would have realised that with R14 and R15 we have an arbitrary write primitive. We could write a minimal ROP chain that calls the make_page_executable and makes the stack executable and returns to a minimal shell code. But I didn’t. I took the scenic route. After leaking the addresses I decided to call the read_n(char* dst, int length) function, to overwrite the stack with arbitrary data. At the time of return RSI contains 0x1000 which is good enough for us, all we need to do is get the stack address into RDI and overwrite the return address with read_n function’s address. As explained previously, pop r14; push r14 can be used to get the original return address into R14. Since the read_n address is really close to this address, we can issue the dec r14; ret instructions multiple times (0x98 times to be exact) to point R14 to read_n. All that is left to do is to write a ROP chain that calls execve with the "/bin/sh",0,0 arguments. Thought the naive, adolescent me. The problem is that we only know the base address of the program and not the address of libc. At the time (heavily sleep deprived), I could not see a way to leak libc addresses easily. It would have been pretty simple though, R15 could be pointed to the .got and then mov r14, [r15]; ret could have been used to read libc function addresses to R14. Instead I run ROPgadget on the binary and noted the lack of useful gadgets with much disappointment. There are pop rdi and pop rsi gadgets in the binary but no control over RDX or EAX which means no execve for us (or any syscall for that matter). At this point I was very tempted to give up and ease my sorrow with fine Belgian beers, but I resisted. ropchain += p64(bss_start) + "/bin/sh\0"
The complete exploit is available here. Without doubt this is not the most efficient way to solve this challenge, yet I hope some people find the write up helpful, educational. Overall I definitely enjoyed this challenge even though I almost lost hope at one point and was really close to giving up. Last but not least, I would like to say thank you to the organisers for the quality challenges and competition. Despair is the name of the game. I began my Google CTF experience with this challenge which was categorized as a medium difficulty pwn task, but I have found it significantly easier than the inst-prof challenge which I solved later during the CTF. Without further ado, let’s dig right into it. PASS: reads the password form the user and compares it with the password stored in the file, if they match system("cat flag.txt") is called, otherwise the program exits. I started my investigation at the read username function, wanting to open some file that has easy to guess content, but the ‘/’ characters are properly filtered. Unlucky for us there is no path traversal opportunity. There is one bug in the read line function, it does not append a \0 character to the received string, but I have found no means to exploit this vulnerability. Every time this function is called from the program a larger buffer is passed to it, which is zeroed out beforehand. The most exciting bug, however, is a trivial buffer overflow in the password check function. It reads up to 4096 characters into a 128 bytes long stack buffer. As we noted at the beginning, stack protection is not enabled which makes this bug “easily” exploitable. All what is needed to complete the exploit is to leak the program base or a libc address. However, looking at the binary it quickly becomes obvious that there is no opportunity to leak anything. The only place the program sends data is when the files (usernames) are listed, and we do not have any control over what gets printed there. The vsyscalls are executed in a way, that when they are called a page fault is generated and caught and the address of this page fault determines which syscall is going to be called (emulated). What this means is that only the “entry point”, the beginning, of the system call can be called so we cannot play with misaligned instructions or call directly the return. This still provides us with a way to traverse the stack for a more useful address already on it. Which can be achieved by overwriting the stack with the address of one of the vsyscalls multiple times. These syscalls also provide some control of the memory content pointed by the RDI and RSI registers. Breaking at the end of the password check function (where the return overflow is going to be triggered), we can observe that RDI points to the beginning of our stack buffer while RSI points to the heap buffer, where the original password is stored. All that is required to complete the exploit is useful address on the stack to return to. This task was fairly simple to solve, especially since I have seen this trick being used in previous CTF challenges. Still I think it was a well constructed and thought out challenge kudos to the creator! This article series introduces the Siemens S7 protocol in depth, the first part detailed the general communication scenario and packet structure. This part further examines the purpose and internal structure of the Job Request and Ack Data messages. These message types are discussed together because they are very similar and usually each Job Request results in an Ack Data reply. The structure of the S7 PDU and the general protocol header is explained in the previous part. However, the parameter header is specific to the message type and for the Job and Ack Data messages it begins with a function code. The structure of the rest of the fields depend on this value. This function code determines the purpose of the message and serves as the basis of further discussion. This message pair (a Job and Ack Data response) is sent at the beginning of each session before any other messages could be exchanged. It is used to negotiate the size of the Ack queues and the max PDU length, both parties declare their supported values. The length of the Ack queues determine the number of parallel jobs that can be initiated simultaneously without acknowledgement. Both the PDU and queue length fields are big endian. This is probably a good place to talk about the S7 authentication and protection mechanisms (even though they have nothing to do with the actual communication setup). There are three protection modes that can be set during configuration for the CPU. No protection: Just as one would expect no authentication is required. Write protection: For certain data write and configuration change operations authentication is required. Read/Write protection: Just like the previous one but certain read operations require authentication as well. It must be noted that even if Read/Write protection is enabled there are certain operations that are allowed such as reading SZL Lists or reading and writing into Marker area. Other operations such as reading or writing Object/Function/Data Blocks should return a permission error. There are two protection level sets associated with the CPU, the assigned protection level and the real protection level. The assigned protection level is the one set during configuration, while the real one is the current protection level applicable for the communication session. During normal operation clients that need read/write privileges query the real and assigned protection levels, after the communication setup, through SZL reads (SZL ID: 0x0132 SZL Index: 0x0004). If authentication is required the password is sent to the device, in a userdata message, which lowers the effective protection level. Just before anyone would think that this provides at least a tiny bit of security let me clarify that it is not. The password is six bytes and sent almost in the clear (XORed with constants and shifted). It is replayable and can be bruteforced. The protocol also provides no integrity or confidentiality protection, message injection and modification is possible. The general rule of thumb when it comes to S7 security is if you can ping the device you can own it. It must be noted here that the S7-1200/1500 series devices use a slightly different approach, protection levels are handled a bit differently and the password sent is significantly longer (it is actually the hash of the password) but it is still constant and replayable. Here is when things start to get a bit more complicated, I highly recommend looking at the provided pcaps while reading this section (wireshark2 comes with S7 dissector enabled by default). Data read and write operations are carried out by specifying the memory area of the variable, its address (offset) and its size or type. Before going into the protocol details I would like to briefly introduce the S7 addressing model. Merker:[M] arbitrary marker variables or flag registers reside here. Data Block:[DB] DB areas are the most common place to store data required by the different functions of the device, these data block are numbered which is part of the address. Input:[I] digital and analog input module values, mapped into memory. Output:[Q] similarly memory mapped outputs. Counter:[C] values of different counters used by the PLC program. Timer:[T] values of different timers used by the PLC program. There are other less common memory areas as well (such as local data [L] and peripheral access [P] and so on). WORD: two bytes wide unsigned integer. DINT: four bytes wide signed integer. REAL: four bytes wide IEEE floating point number. COUNTER: counter type used by the PLC program counters. An example address of a variable is DB123X 2.1 which accesses the second bit of the third byte of the Data Block #123.
any-type: This is the default addressing mode and it is used to query arbitrary variables. All three parameters (area, address, type) are specified for each addressed variable. db-type: This is special mode designed to address DB area variables, it is more compact than the any-type addressing. symbolic-addressing: This mode is used by the S7-1200/1500 series devices and allows the addressing of certain variables with their pre-defined symbolic names. This mode will not be covered in detail here. Function Code:[1b] constant value of 0x04 for read or 0x05 for write Jobs and replies. Item Count:[1b] number of following Request Item structures. Request Item: this structure is used to address the actual variables, its length and fields depend on the type of addressing being used. These items are only present in the Job request and are emitted from the corresponding Ack Data no matter what the addressing mode is or whether it is a read or write request. Read Request: the Data part is empty. Read Response: the Ack Data message’s Data part consists of Data Item structures, one for each of the Request Items present in the original request. These items contain the actual value of the read variable and the format depends on the addressing mode. Write Request: contains similar Data Items as the read response, one for each of the Request Items in the Parameter header. Similarly, these contain the variable value to be written on the slave device. Write Response: The Data part of the Ack Data message simply contains a one byte error code for each of the Request Items in the original Write Request. See the constants.txt for the error code values. To sum it up, the Request Item always contains the description of the variables and multiple of these can be sent in the Job request while the Data Items contain the actual values of the described variables. The Data Item structures must begin on even bytes so if their length is an odd number and there is a following Data Item then they are padded with a zero byte. What is left to be discussed is the format of the Request/Data Item structures. As previously mentioned they are dependent on the addressing mode being used so they are going to be introduced based on that. Specification Type:[1b] this field determines the main type of the item struct, for read/write messages it always has the value 0x12 which stands for Variable Specification. Length:[1b] the length of the rest of this item. Syntax ID:[1b] this field determines the addressing mode and the format of the rest of the item structure. It has the constant value of 0x10 for the any-type addressing. Variable Type:[1b] is is used to determine the type and length of the variable (usual S7 types are used such as REAL, BIT, BYTE, WORD, DWORD, COUNTER, …). Count:[2b] it is possible to select an entire array of similar variables with a single item struct. These variables must have the same type, and must be consecutive in the memory and the count field determines the size of this array. It is set to one for single variable read or write. DB Number:[2b] the address of the database, it is ignored if the area is not set to DB (see next field). Area:[1b] selects the memory area of the addressed variable. See the constants.txt for the memory area constants. Address:[3b] contains the offset of the addressed variable in the selected memory area. Essentially, the addresses are translated to bit offsets and encoded on 3 bytes in network (big endian) byte order. In practice, the most significant 5 bits are never used since the address space is smaller than that. As an example DBX40.3 would be 0x000143 which is 40 * 8 + 3. Error Code:[1b] the return value of the operation, 0xff signals success. In the Write Request message this field is always set to zero. Variable Type and Count:[1b 2b] same as in the Request Item. Data: this field contains the actual value of the addressed variable, its size is len(variable) * count. Specification Type:[1b] same as with any-type addressing. Syntax ID:[1b] determines the addressing mode, has a constant value of 0xb0 for db-type. Number of Subitems:[1b] the number of following Subitems. Size:[1b] specifies the number of bytes to read or write from the selected address. DB Number:[2b] the DB where the addressed variable resides. Address:[2b] byte offset of the variable into the given DB. Error Code:[1b] the return value of the operation, 0xff signals success. Variable Type:[1b] always set to 0x09 (Octet String). Length:[2b] length of the remaining Subresponse data. Error Code:[1b] the return value associated with the Subitem request. Data: actual data to be read or written, interpreting this requires the corresponding Subitem. This is where things start to get messy. First of all, in Siemens terminology a download is when the master sends block data to the slave and upload is the other direction. On the Siemens devices, program code and (most of) the program data are stored in blocks, these blocks have their own header and encoding format, which will not be discussed here in detail. From the protocol’s point of view they are binary blobs that need to be transported (for the interested reader the snap7 sources provide information on the block headers and their encoding). OB: Organisation Block, stores the main programs. (S)DB: (System) Data Block, stores data required by the PLC program. (S)FC: (System) Function, functions that are stateless (do not have their own memory), they can be called from other programs. (S)FB: (System) Function Block, functions that are stateful, they usually have an associated (S)DB. The purpose of these blocks are well described in the Siemens documentation. File Identifier:[1 char] as far as I know this always has the value of ‘_’. Block Type:[2 chars] determines the block types, see the constants.txt for concrete values. Block Number:[5 chars] the number of the given block in decimal format. Destination File System:[1 char] this field can either have the value ‘A’ for Active or ‘P’ for Passive file systems. Blocks copied to the active file system are chained immediately, which means they are in effect as soon as the PLC execution resumes. On the other hand, blocks copied to the passive file system need to be activated first. An example filename is _0800001P which is used to copy OB 1 to or from the passive file system. The structure of these messages are pretty simple, however the message sequence (especially for download) needs a bit of explaining. 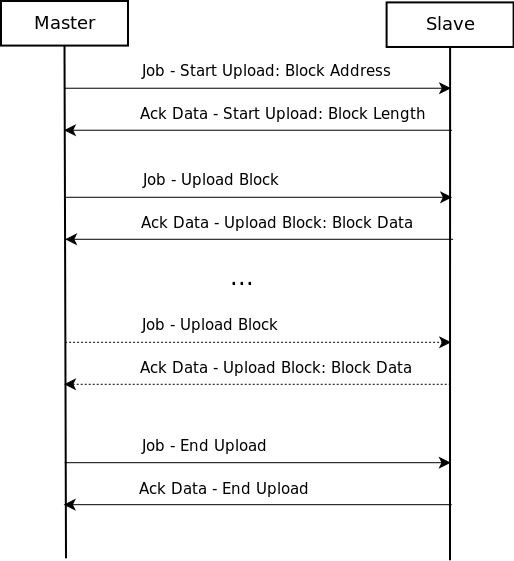 In the Ack Data - Start Upload message the slaves tells the length of the block and then the master keeps sending Job - Upload Block messages until receives all the bytes. Finally it closes the upload sequence with a Job - End Upload message. The actual data of the block is sent by the slave in the Ack Data - Upload Block messages. Function Code:[1b] 0x1d for Start Upload. Function Status:[1b] only used in the Upload message, set to 0x01 if more data is to be sent. Session ID:[4b] a unique id associated with each upload sequence, it is set in the Ack Data - Start Upload message. Filename Length:[1b] length of the following filename. Filename: the filename that identifies the block as introduced above. Function Status:[1b] same as above. Session ID:[4b] the Session ID is set here, consecutive messages use the same value. Length String Length:[1b] length of the following Block Length String. Length String: the decimal length of the block encoded as an ASCII C string (don’t ask me why…). Contains the Function Code (0x1e), Function Status, Unknown (0x0000) and Session ID fields as discussed above. Function Code:[1b] 0x1e for Upload. Function Status:[1b] set to 0x01 if more data is to be sent. Length:[2b] the length of the Block Data. Block Data: part of the uploaded data block. Contains the Function Code (0x1f), Function Status, Unknown (0x0000) and Session ID fields as discussed above. The key difference between upload and download is that during download the direction of the communication changes and the slave becomes the master (well sort of). After the initial Request Download exchange the slave sends the Job messages and the master replies with Ack Data, this is the only exception to the “slave only replies” rule. After all the bytes are sent the master (the original) sends the Download Ended Job to close the download session. See the sequence diagram below. The structure of the actual messages are really similar to the upload messages so I am only going to introduce the differences. For accurate syntax description open the example pcap in wireshark. 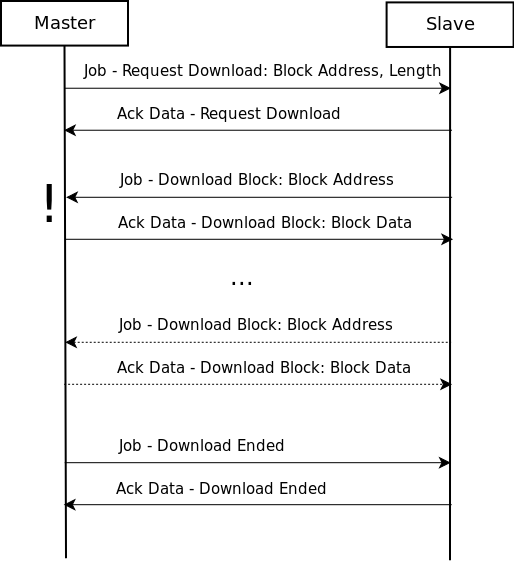 The Job - Request Download message contains two extra fields, the Block Length of the downloaded block and the Payload Length (the length without the block header) of the block. Both of these fields are decimal numbers encoded as ASCII strings. The response Ack Data - Request Download simply contains the Function Code. Another significant difference is that, although the Session ID field is present it is not used (remains 0x00000000) instead the Filename is transmitted in each Job - Download Block. The structure of the rest of the messages is same as discussed before. PLC control messages are used to execute different routines on the slave device that modify its execution/memory state. Such commands are used to start or stop the PLC control program’s execution, activate or delete program blocks on the device or save its configuration to persistent memory. The structure of these messages are fairly simple, they are going to be explained without discussing the exact details (for that see the attached captures). The Job - PLC Control message consists of two main parts, the ASCII name of the called method and its parameter (also encoded as an ASCII string). The method name is structured in a similar manner as the file names introduced in the block transfer section. The parameters depend on the method type and they can be thought of as an argument to it. The Ack Data message simply contains the PLC Control function code. _INSE: activates a downloaded block on the device, the parameter is the name of the block (e.g. OB1). _DELE: removes a block from the file system of the device, the parameter is again the name of the block. P_PROGRAM: sets the run state of the device (start, stop, mem reset). It is sent without parameter to start the device, however stopping the plc program uses a different function code (see next section). _MODU: copy ram to rom, the parameter contains the file system identifiers (A/E/P). The PLC Stop message is essentially the same as the PLC Control message. The only difference is that there is no parameter in the message and the routine part is always set to P_PROGRAM. I have no idea why it has its separate type instead of using a parameter to determine whether it is a start or stop message. Well, this blog post grew way longer than I originally planned it to be, but I hope it will be useful for some. This might be obvious now, but the S7 protocol is not a well designed one. It was originally created to simply query register values, which it did kind of all right, but then functionality was kept being added until it became this monstrosity. It is filled with inconsistencies and unnecessary redundancies and it only gets worse with Userdata messages. These irregularities and design flaws become way more obvious (and annoying) while trying to write a parser for the protocol. The 65th mapped page is on a fixed address and functions as a “shared memory” between parent and child process, more on it later. There are also 4 pages mapped on the 0x400000000 address with r-x permissions, this area is going to hold our shell code. After the pages are mapped the random bits are erased from the memory. Then the program goes on and reads our shell code to the executable page and jumps to it. Sounds perfect but unfortunately, before all of these shenanigans it calls some magical mystical prctl functions that are used to set up some really unwelcomed seccomp rules. Meanwhile the parent process ptraces the child and after the child breaks (calls int 3) it pokes its memory with ptrace. The poked memory is compared to the original random bytes and if they match the flag is printed. So the goal of the challenge is to figure out the original random bytes based on the position of the 64 mmaped pages and then write the solution to the predefined address. Basically it confirmed my worst fear that none of the syscalls are available (besides exit, but screw that). At this point it is pretty clear what needs to be done, we have to decide if a given page is mapped in the memory without access to any syscalls. The question is how? The main problem is if we touch any unmapped page it generates a SIGSEGV so we lose. My initial idea was to set up a SIGSEGV signal handler or use a library function like mincore but the problem is that of course these all rely on different system calls. So this route was a no go. This left me with no other option than different side channel attacks that use timing windows to determine if memory is mapped or not. The problem itself is very similar to certain KASLR (Kernel ASLR) attacks where the memory is not accessible so timing channels are used to evaluate where certain pages are located (shout-out to my teammate @tukan who provided me with a bunch of valuable resources on the topic). The first attack I looked into was the recent JS ASLR derandomization attack AnC, but I dismissed it quickly as it requires memory reads. The next one on the list was DrK a KASLR derandomization attack which does exactly what I needed, it tells about a page if it is mapped or not without accessing it. The only problem is it relies on a specific hardware feature only available in some new intel CPUs called TSX (Transactional Synchronization eXtensions). The tsx-tools git repository provides tools to check if the feature is available by using the cpuid instruction. Note that since all syscalls are disabled it is impossible to send back data, however when the int 3 is called the parent sends back a “Success” or “Failed!” message. On the other hand when the program crashes no messages is sent back. This one bit information was enough to leak the results of the test. Which failed. Unfortunately the CPU that hosted the challenge did not support the TSX feature. My last resort was the side channel attack with the prefetch instruction, in essence it is a similar attack than the previous (see the paper and blogpost). The prefetch instruction fetches data from the supplied address into the specified cache (for the attack Layer-2 cache is used for maximum timing differences, see prefetcht2) and it does no validity checking at runtime. Great, but what is even better it takes longer to fetch addresses that are not mapped to physical addresses since searching all the page table entries is slower than hitting something earlier of course. I briefly explain what it does. It first calculates a reference time for a mapped page (the “shared memory” solution page) and a surely unmapped page and calculates their average which is the reference value. Then it iterates over all the pages in question and decides whether they are mapped or not using the timing window. The measure loop does multiple iterations to eliminate jitter and returns the lowest received time. The actual measurement happens in the measure_prefetch function which uses the rdtsc instruction to read the CPU time stamp register for accurate time indication. The actual source code of the rdtsc.h is stolen from here. There are multiple prefetcht2 calls because the gcc inline asm register clobbering creates an overhead (four mov instructions) that could mess up the results. The output of each decision is written to the “shared memory” which is later checked by the parent. echo "Needs c source as argument"
And to my greatest surprise the shell code worked like a charm, it gave me the flag on the first run. I have really enjoyed working on this challenge as it was quite different than the usual memory corruption pwn tasks.